Anti-Programmed Death-1 (PD-1) based immunotherapies have led to substantially improved survival in patients with advanced melanoma [1–4]. Combination therapy with ipilimumab and nivolumab results in higher response rates albeit with significant toxicity . Despite these improved outcomes, many patients have either primary resistance or develop acquired resistance . 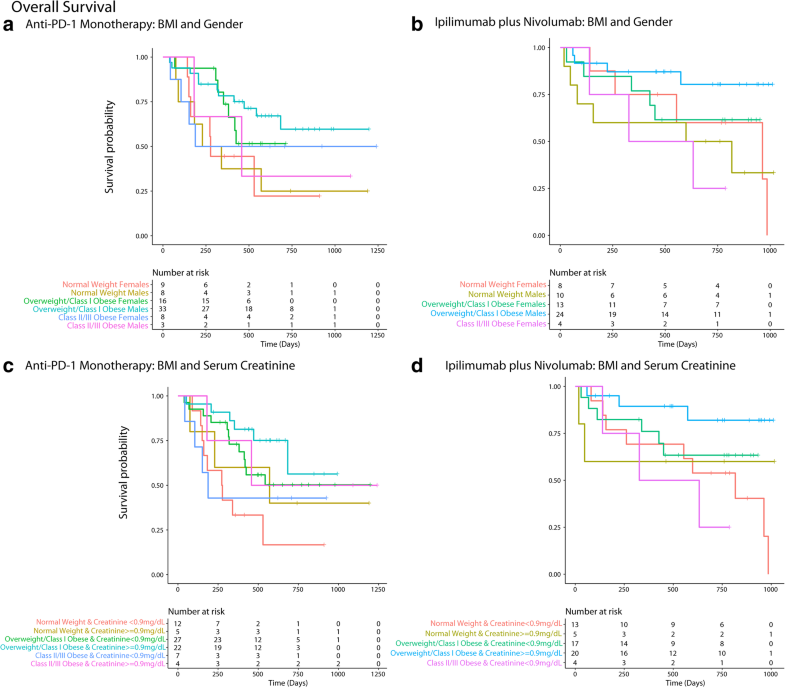 While tumor PD-L1 expression, mutational/neoantigen load, and IFN-γ signatures have some utility as predictors of outcome with checkpoint inhibitors [7–9], clinical predictors also may have value for the identification of patient subgroups who have longer survival and/or higher response rates to these therapies. Nearly 70% of the adult population in the United States are either overweight or obese according to the CDC/National Center for Health Statistics and has reached epidemic proportions . 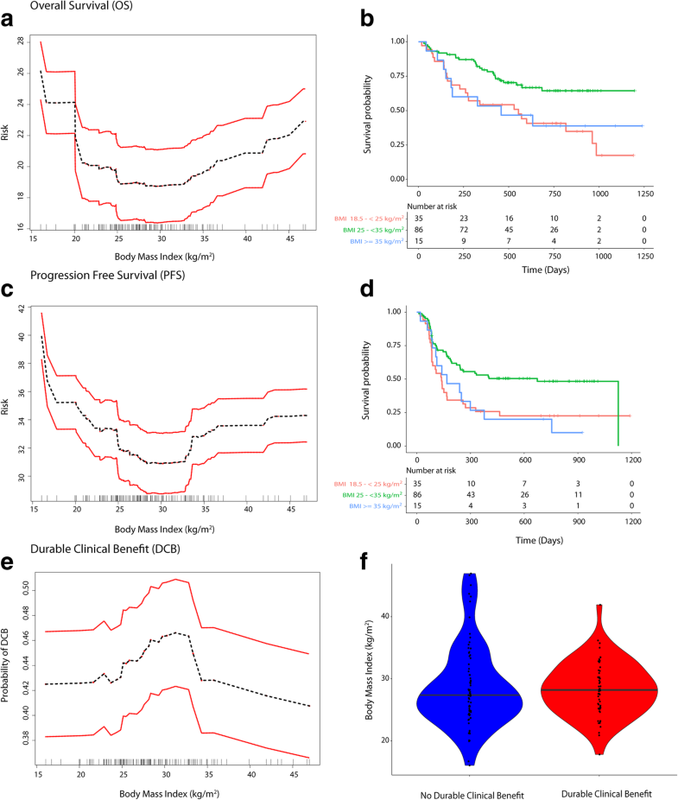 While obesity has generally been shown to pose a risk for many chronic diseases [11–13] as well as some solid cancers such as colon cancer, esophageal carcinoma and renal cell carcinoma , it has been associated with improved survival in other cancers including renal cell carcinoma , colorectal cancer  and non-small cell lung cancer . Observation of improved survival outcomes among overweight/obese patients compared to normal weight patients has been referred to as the “obesity paradox” . 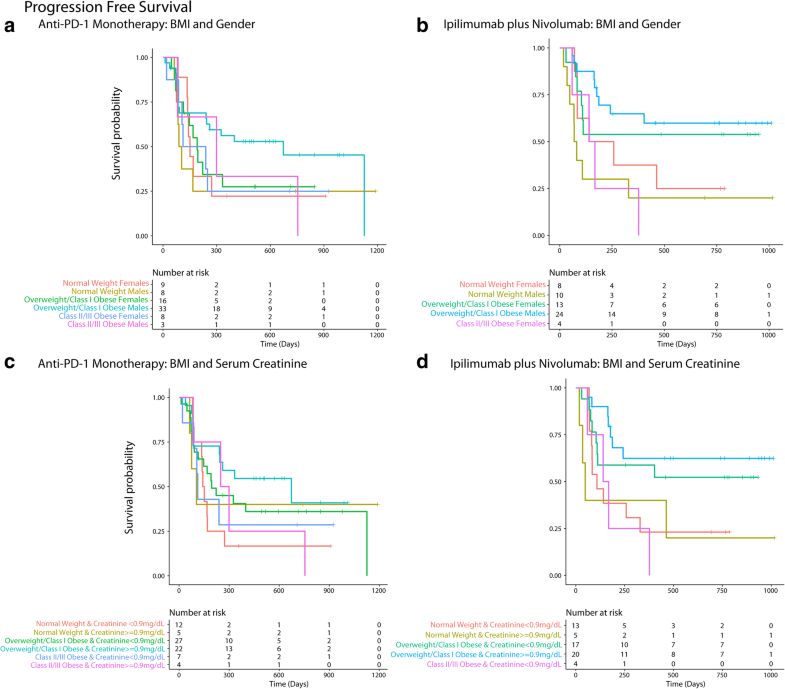 This observation has recently been documented in metastatic melanoma patients in the context of immune checkpoint inhibition as monotherapy (PD-1/PD-L1 or CTLA-4) and targeted therapy in a pooled meta-analysis, but not of chemotherapy . In addition, the association was noted predominantly in males and gender-based differences in hormonal effects were proposed as one of the possible explanations. 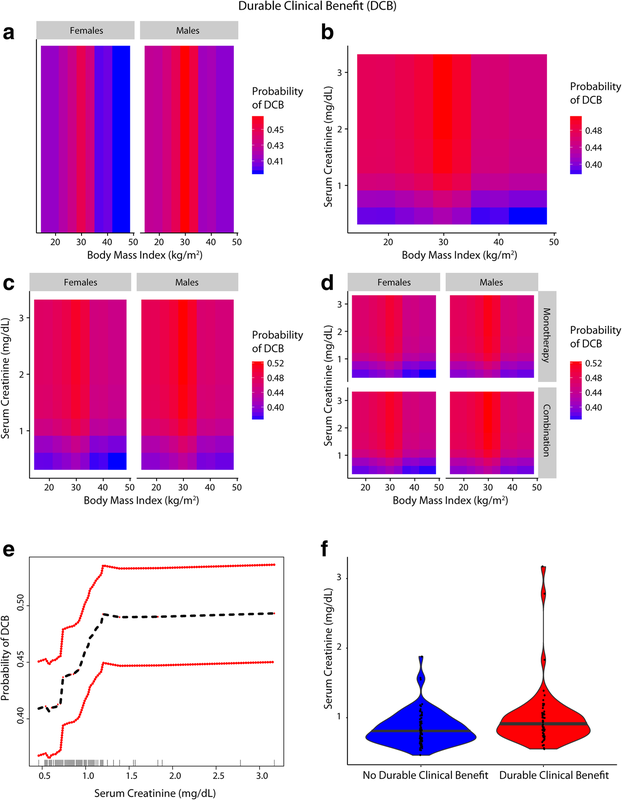 Random Survival Forests (RSF) for survival outcomes and Random Forests (RF) for the binary outcome of DCB (See Additional file 1: Text) were used for analysis given distinct advantages of these methods in incorporating non-linear relationships, handling multi-collinearity, inclusion of covariate interactions and ability to handle high dimensional data under a non-parametric framework [25–29]. The adaptive nature of the forests and powerful visualization techniques which uncover complex patterns and inter-relationships/higher order interactions  with ease were of interest to elucidate the potential factors that could explain the obesity paradox in this treatment setting. The minimal depth criterion was used to assess the importance of BMI among other features studied. The threshold for minimal depth filtering was minimal depth below the mean value (Refer Additional file 1: Text). A total of 42 features deemed clinically important by expert knowledge (listed above) were assessed in the RSF and RF models. The number of features included for each individual tree was set at 7 and 2000 trees were grown in the forest. No feature selection was performed. Low serum creatinine (< 0.7 mg/dL) is a surrogate marker for frailty and sarcopenia (low skeletal muscle mass) particularly in the elderly; it is a strong predictor of mortality among patients with normal BMI in the setting of chronic diseases, for example coronary artery disease . Interestingly, serum creatinine was found to modify the association of BMI (paradox) with mortality, as evident by the association of low creatinine levels with poor outcomes in hemodialysis patients . 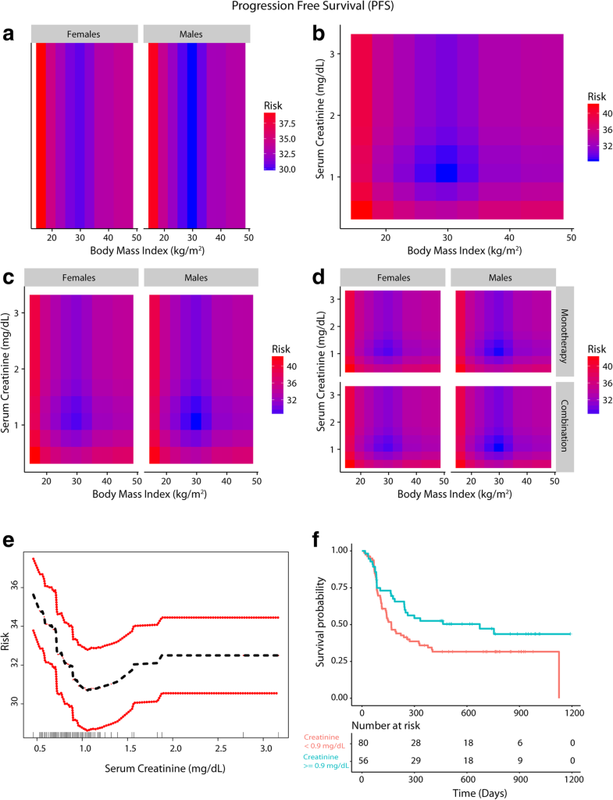 In cancer patients, sarcopenic obesity was associated with the highest risk of mortality demonstrating that body mass composition can modify the association of BMI with survival; accordingly, the paradox was seen only when obesity was defined by BMI . Serum creatinine levels were found to correlate with skeletal muscle mass measured by urinary creatine excretion/DEXA (Dual Energy X-ray Absorptiometry) in colorectal cancers patients as well as in healthy volunteers, albeit to a varying extent [38–42]. Nevertheless, serum creatinine to assess skeletal muscle mass indirectly represents a simple alternative when renal function is accounted for [41–43] and is especially relevant in advanced cancer where the growing metabolic demands of metastatic tumors lead to mobilization of nutrients from skeletal muscle ; we therefore included eGFR in the primary analysis to account for renal function. Less than 10% of the patients had prior history of CKD at baseline. Etiologies leading to low serum creatinine levels other than older age, female gender and the cancer-related catabolic state (e.g. rapid renal clearance, pregnancy, fever/acute illness and advanced liver disease) were unlikely to explain low serum creatinine levels in our cohort [45, 46].